This coming Wednesday is the Franklin Garden Walk. The Franklin Garden Club holds one of the most beautiful and well-organized garden tours in the state of Michigan. It is my privilege to be a part of the tour for the fourth year in a row as a participating artist. The garden club members enjoy sponsoring local artists by inviting us to come and paint in the gardens during the tour. 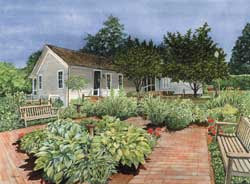 The Broughton Garden, the painting shown here which I painted a few years ago, depicts the historical garden in Franklin, Michigan which the garden club maintains. To learn more about the garden club you can visit the events page on my website by clicking here. There is information about the tour and a link to the Franklin Garden Club. You may like to contact them for Garden Walk ticket information.